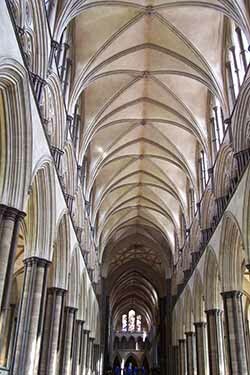 The history of Salisbury goes back to arguments between those in charge at the Castle who were the administration of Old Sarum, and the Bishop of the Cathedral. So Old Sarum Cathedral was moved to the plain below and Salisbury was born. The new town, New Sarum as it was known to start with, was planned in a grid pattern and construction started in 1219. 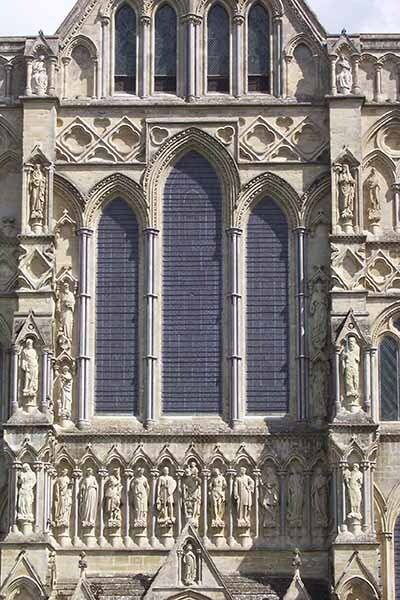 Work on the Cathedral began in 1220. That this magnificent cathedral was finished in more or less one generation is a tribute to those brilliantly skilled people who built it. Though it is likely that in the early years Bishop Poore pushed the project hard. The detail is amazing, both outside and inside. As you wander round look carefully at the wonderful carving. What tradesmen! Heartbreakingly beautiful. So the history of Salisbury began. Settlement around the new Cathedral grew. Life in the valley was less stark than the barren hillfort, plenty of water and arable land. There was work to be had with the building of the Cathedral. With the influx of people services and traders followed. In contrast Old Sarum slowly became abandoned, although it remained the administration area well into the 1300's. Henry III granted the Bishop of Salisbury in 1227 a Charter for his town which included the right to hold an eight day fair in The Market Place. Pretty early in the piece. Fairs attracted people and money to the town. Helpful for the projects under way. However there has been some unauthorised ones before that. Wilton and Salisbury had quite a few arguments about fairs each accusing the other of holding fairs to the detriment of the other. Wilton was the county town after all and somewhat bigger than this upstart of a new one. Nowadays it is a three day fun fair! In 1289 the Treaty of Salisbury was signed. An agreement between Robert The Bruce of Scotland and Edward I and of England and others. Margaret, the Maid of Norway, was to be sent to Scotland the following year and her future marriage was not to be decided until then. Women of prominent families were hostages to male ambition in those days. Sadly Margaret died in a storm at sea on the way to Scotland. By the following century the city wall had been built and it was already the biggest town of the county. It never was the capital of Wiltshire. Wilton was the original capital and that town gave the name of Wiltshire to the county. Trowbridge is the current capital. © Copyright Sebastian Ballard and licensed for reuse under this Creative Commons Licence..
At the end of 1483 Henry Stafford, Duke of Buckingham (one of the suspects in the plot to murder the Princes in the Tower) was beheaded in The Market Place after a failed rebellion against Richard III. Debenhams in Blue Boar Row occupies the very spot and Henry's beheaded ghost is said to haunt the shop! The blood stains from his severed head manifest themselves from time to time! Brrr!!!! 1688 is the year of what is generally known as the Glorious Revolution. A fight for the throne between James II and William of Orange whose wife was James' daughter Mary. John Churchill, Lord Marlborough, was in charge of the King's army which was at Salisbury, but there were arguments between the King and Churchill. Churchill wanted to attack, the King took other advice. Defections followed and James fled. William of Orange and Mary succeeded to the throne. 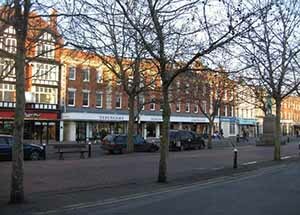 The history of Salisbury continues, the city has remained an important centre to this day. It has become over the centuries a delightful cathedral city. It is a great place to live and for tourists a pleasure in itself as well as a most convenient centre for touring the area. The Army and Salisbury Plain have been synonymous for some time so that area is still important in the defence of the realm. Salisbury has a collection of hotels of all types and sizes, What you want should be there! Within easy distance of Salisbury there are some delightful country cottages. Nice idea!